Find your perfect vacation rental. 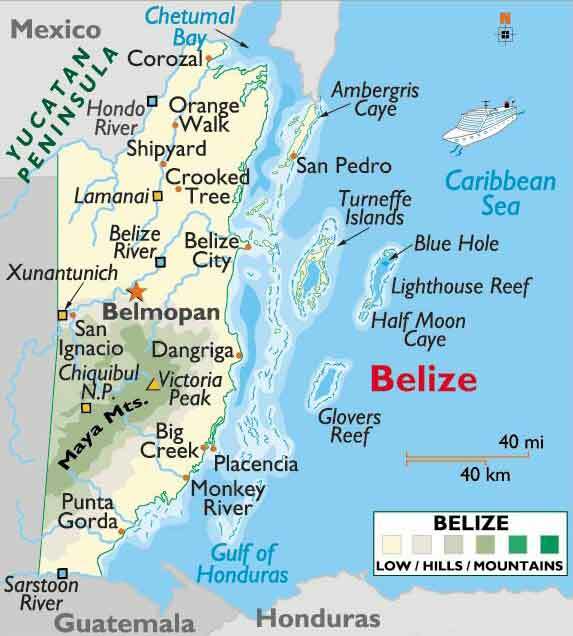 Belize lies on the eastern or Caribbean coast of Central America. The inner coastal waters are shallow and are sheltered by a line of coral reefs that make swimming and snorkeling ideal from Belize villas. The Belize Barrier Reef, second largest in the world, spans 185 miles of the country’s coastline and features dive sites inside and outside the reef. The Blue Hole was originally a cave that formed about 10,000 years ago. It's visible from outer space. The water is clear and underwater visibility routinely extends hundreds of feet, so you can easily view activity under the surface. Belize villa rentals by the beaches of the Caribbean coast or near mystical Maya temples, each location in Belize offers you many unique Belize villas to stay. There are vacation villas suitable for all, including adventure seekers, divers, beach vacationers, eco-tourists, family groups, honeymooners and more. Ambergris Caye is the largest of the 200-plus islands located off the Belize coast. It is only half a mile from the Barrier Reef. The island offers a wide variety of water-oriented and land activities all easily accessible from villas in Ambergris Caye. San Pedro Town, located in the south of Ambergris Caye, is about a mile long and only a few blocks wide and some streets are still made of sand. There are few cars; instead, the vehicles of choice (besides feet and bikes) are golf carts, which are available for rent. Gift shops, boutiques, bars, beach parties, cafes, and restaurants abound. Placencia is a gorgeous emerald peninsula in southern Belize with 16 miles of sandy beaches where there are Belize villas for rent. The peninsula has many restaurants, some of which are set up in the patios of private homes along the path between the beach and the lagoon. You can enjoy a delicious plate heaped with the Belizean national dish of spicy stewed chicken, served with a delicious rice and bean combination cooked in coconut milk. There are many restaurants throughout Belize specializing in fresh seafood (lobster and conch are plentiful and inexpensive when in season). If you select Gibnut from a menu, you’re about to dine on a rainforest rodent that is popular game meat in Belize also known as the Royal Rat. The Queen of England ate it during a visit to Belize and gave it the Royal Thumbs Up. Tired from an active day? Enjoy dinner prepared by your chef in your private Belize villa. From the moment you arrive in Belize – whether you are an adventure traveler, taking a family trip or in the country for a relaxing Belize villa vacation – Belize people and culture make you feel welcome and comfortable.